The Butterfly Effect – Walk the dog deep to fetch more fish! In late spring of 2004 a package arrived at my door from the folks at Shimano. It included a light rod, a very robust reel, an instructional DVD and a handful of weird blade-like jigs. There had been growing hype about a “revolutionary” new fishing system coming out of Japan called butterfly jigging. Now it was in my hands. As a fishing show host I receive dozens of “hot” products every season, and few of them actually live up to their claims. Butterfly jigging looked like just one more piece of fancy marketing designed to catch more fishermen than fish. A month later I was making a solo run from Montauk, N.Y. to the Vineyard Sound. There had been scattered reports of schoolie bluefin tuna, so I brought the butterfly gear along to give it a try. When I came upon my first pod of fish, I threw a five-inch jig just beyond the school, let it sink for a few seconds, and started the unique, relatively slow rhythmic retrieve that imparts an erratic “butterfly” action to the lure. After a few pumps I was hooked up! Braided line screamed off the reel as the fish made an incredible run. Several minutes later I was unhooking a 60- pound bluefin. After a few photos it was on its way. I spent the next few hours stopping at every school I saw, and though I did not catch a fish on every cast, I lost count of how many I did catch. This jigging system, which includes a unique rod, a handful of reels and a specific style of jig, is not only incredibly effective, it is also very versatile. A practiced angler can target tuna, kingfish, yellowtail, stripers, cod, grouper, jacks and dozens of other inshore and offshore species almost anywhere in the water column. The key to butterfly effectiveness is presentation. Most jigs are dropped to a specific depth, lifted sharply and then dropped again, or dropped and then ripped vertically through the water column. Butterfly jigs swim up through the water column when anglers employ a unique pump-and-reel motion. The cut of the jig edge combined with the pumping action causes the jig to veer side to side. The action is akin to a “walk-the-dog” retrieve on a surface lure, except the jig is walking up the water column, not across the surface. With butterflies, anglers are able to drop the jig to a specific depth, keep it there longer and present the jig with a very erratic, seductive motion. To get the right action, you need the right retrieval technique. After letting the jig fall to the desired depth, point your rod tip at the water and employ a continuous rhythmic pumping action coupled with a constant, steady turning of the reel. Turn the reel just fast enough to keep the slightest load on the tip of the rod. Don’t let the lure drop nose-first, as you would with a normal jig. Keep it walking up the water column. As you do this you’ll be moving the rod tip from one to two feet per pump. With high-speed reels, which are highly recommended, you’ll be lifting the rod on the upswing of the reel, and lowering it on the downstroke. The result is an upward zigzag swimming motion. If fish are suspended, drop the lure somewhat deeper than the target depth and begin the retrieve. In many cases the jig is simply dropped to the bottom. Either way, retrieve for a period of time, drop the lure back down and start the retrieve again. Around a wreck or reef, the jig is always dropped to the bottom, retrieved for a fairly short period of time, and dropped back into the strike zone. Butterfly jigs are available in a wide range of colors and sizes, and are now being offered by Shimano, Tormentor and several other manufacturers. Colors should be chosen based on the available bait in the area, but size should be chosen based on the depth being targeted. 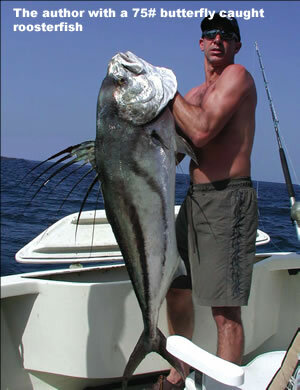 The angler must choose a jig large enough to maintain a nearly vertical retrieve (except when casting to busting fish). Greater depths and faster drifts require heavier jigs. With both long and short butterflies, the shape of the jig cuts through the water on the drop (rather than flutter like a traditional metal jig), allowing smaller jigs to reach greater depths. The slow retrieve keeps the jig in the “hit zone” longer. There’s also an excellent hook-up ratio achieved by the rig design. Though the jigs are clearly the business end of this system, rod selection is critical. For the jig to work correctly, the rod must stay loaded throughout the retrieve. This requires a fairly soft, medium-fast rod. Shimano designed the Trevala rod specifically for this system. These rods appear light, but are amazingly strong and can put incredible pressure on a fish. Each rod is rated for a specific range of lure weights. Using jigs outside that range will certainly compromise the presentation. Reel selection is also very important. Though the retrieve is fairly slow, a reel with a fast retrieve is required so the rhythmic pumping action can be properly maintained. For conventional reels, narrow spools are preferred so that the angler need not worry too much about guiding the line. Spinning reels can also be used, but they must have premium drag systems and significant line capacity. Some anglers find the jigging action somewhat easier to impart with spinning gear. This system would not be possible without the advent of braided lines. Low diameter, low stretch lines such as Berkley Big Game Braid and Stren Super Braid get the lures down fast, provide superior sensitivity and give narrow conventional reels and spinning reels better line capacity. The best choice for spinning reels is Berkley Fireline. Its fused construction has a more textured surface, making it much more resistant to wind knots. These lines are always used in conjunction with a three- to six-foot fluorocarbon leader. The connection between the line and the leader is critical. Most anglers tie a short Bimini twist in their main line, and then use an Albright knot to connect the double line Bimini to the leader. This connection will pass easily through the guides and has a very high breaking strength. The connection between the leader and the jig is also unique. The leader is tied directly to a solid ring that holds one or two stinger hooks (1/0 to 7/0 depending on jig size). A split ring is then used to connect the jig to the ring. This allows for quick and easy jig changes, provided the angler carries split-ring pliers. It also positions the hooks at the head of the jig rather than the traditional position in the tail. Most strikes are at the head where the hooks are positioned. Additionally, when a fish is hooked, they’re fighting on a direct line to the rod and cannot use the leverage of the lure to unhook themselves. Though it takes a bit of practice to get truly comfortable with this system, the effectiveness is immediately evident. The butterfly jigs create a more enticing presentation than traditional options such as diamond jigs and bucktails, and are capable of targeting nearly any depth in the water column. The erratic action clearly imitates a wounded or fleeing baitfish, and the ability to keep the jig in the hit zone for a longer period of time translates to more hook-ups and more fish!